Blog post inspired by... a hunt for everyday style inspiration. I've never been blessed with the talent of being able to throw together a stylish looking outfit in a minutes notice. I just don't have that natural flair for styling, but oh how I wish I did. So whenever I have that little extra time in the morning or I have something coming up where I want to put that little bit more thought into my outfits I look for some outfit inspiration on places like Instagram, Lookbook and Pinterest. This Friday I'm heading off on an adventure to London (eeeek so excited). In an effort to minimise my luggage (and time to get ready in the morning) I thought I'd plan my outfits ahead of time. 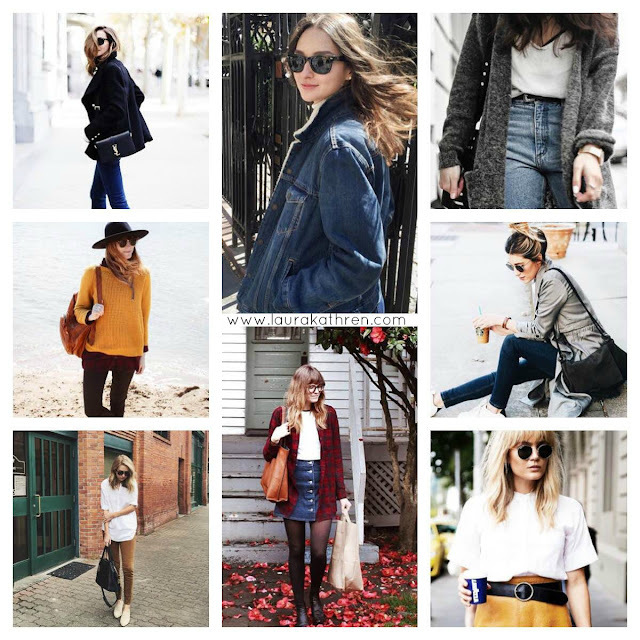 So I went off in search of some style inspiration and so this is the topic of today's Moodboard Monday - all inspired by the lovely stylish ladies of Instagram. I've always been into black and white with pops of colour so you can see that theme running throughout. Layering is also one of my favourite ways to style clothes. One of my favourite things in my wardrobe right now is my little ASOS pinafore so when scouring my feed I also wanted to look for ways to style it up for day to day. I thought I could style it similar to Steffy's outfit in the central bottom photo with a plain white t-shirt underneath, some tights and boots and a cosy oversized shirt thrown over. So on my 'to pack' list now is a couple of pairs of sunnies, my pinafore, high waisted jeans, leggings, a denim jacket, a couple of baggy coloured jumpers, a shirt, a couple of black or white t-shirts, a high waisted skirt, a pair of trainers and a pair of boots. Sorted! If you fancy following along with my trip to the big city you can follow me over on Instagram for probably lots of shots of flowers, coffee and food mountains... can you really complain? Would you like to see how I (attempt to) style these up when I get there? And please let me know where you get your outfit inspiration from? I need all the help I can get!